Home / British TV / SPOTY / UK TV / Before texting and The X-Factor, there were the SPOTYs and "postcard votes"
Before texting and The X-Factor, there were the SPOTYs and "postcard votes"
The BBC’s Sports Personality of the Year Award’s (SPOTY) progression from a minor 45-minute program, to an annual event that tours the UK, has been meteoric. This year will be the 61st edition of what sportsmen and women in the UK view as the greatest accolade they can receive - but what exactly is it? Despite its name, it is not a personality contest, with the criteria for making the shortlist being only sporting achievement. The personality element is introduced with a public vote which determines who lifts the trophy. Paul Fox – who ran the TV show Sportsview on BBC - originally came up with the idea back in 1954. The winner would be chosen by the public and the award presented during Sportsview. Viewers were asked to submit their preferences via postcards [I wonder if Simon Cowell ever thought of that!]. Over 14,000 votes were received crowning Christopher Chataway as the first SPOTY winner in a televised ceremony held in the Savoy Hotel. It could be said that SPOTY is the UK’s version of the ESPY’s, done in quintessentially British style. When the awards were first introduced, the UK was very much still in grips of a post-war recuperation under the Martial plan. Therefore, the lavish spending of the American allies was not possible. 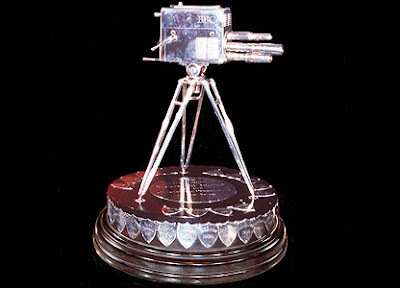 The BBC director even referred to the cost of the SPOTYs at the time as “too high” [£25 in prize money and £30 for the trophy]. What begun as one award has grown to no less than eight! This has been combined over the years with special awards on particular years. In 1999, for instance, Muhammed Ali won the award for Sports Personality of the Century Award. Special achievement awards were also introduced to recognize exceptional athletic accomplishments. Most recently, two comedians have received the honour: David Walliams won in 2006 for swimming the English Channel and raising over £1 million pounds for the charity Sports Relief. The same organisation benefitted in 2009 too when Eddie Izzard ran an incredible 43 marathons in 51 days! The award show has grown exponentially in the 61 years since it was introduced. After the Savoy Hotel became too small, the BBC used its own television studios. The last ceremonies have been broadcasted from huge arenas across the UK. Paul Fox probably never imagined that his idea – which combined public voting with televised live shows – would grow into the huge entertainment reality TV industry of today, with shows like The X-Factor, American Idol and America’s got Talent all originating in Britain. This year’s award ceremony will take place on the 20th of December. As it has become routine, the 2015 SPOTYs are already creating debate. This year we’ll see a larger shortlist than usual with Tyson Fury and Andy Murray both getting special entrances due to the lateness of their achievements. Andy Murray is favourite with the sports bookmakers after his efforts with Team GB in the Davis Cup. However, controversy surrounds the other latecomer: Tyson Fury. The boxer from Manchester shocked the world after defeating the imperious Wladimir Klitschko in November. In the build up to this fight the self-proclaimed Gypsy King gave an interview to national newspaper Daily Mail, where he made some contentious remarks about homosexuality. Currently, he faces a backlash from not only voters - who are calling him to be removed from the shortlist - but even the press. Confusion and controversy aside, the SPOTY awards are the the cherry on top of the British sporting cake. They return year after year and they keep getting bigger and better. You never know… maybe it will be able to compete with its Americans cousins soon too?